Hi, I’m Amy! Also known to some as Alliekatmom. 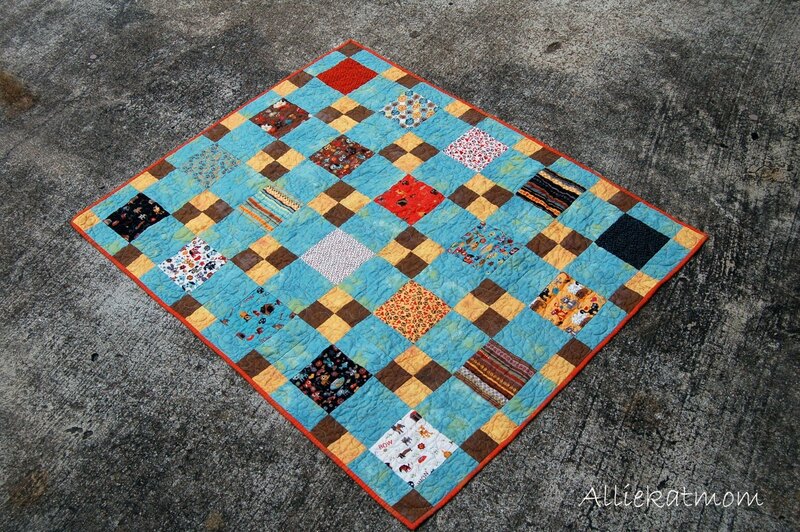 I have a quilt in a day quilt to share with you. 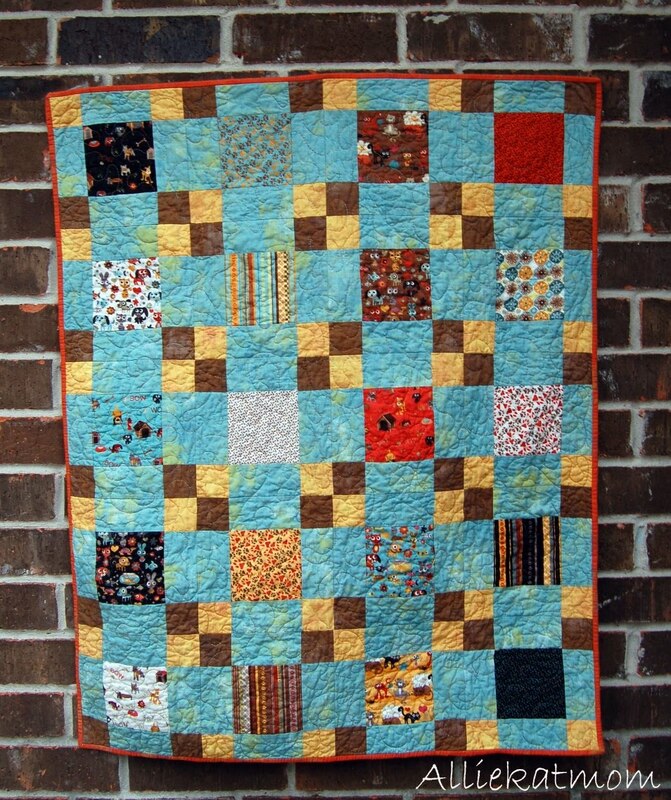 This quilt is super easy to make as a last minute baby quilt, or maybe a charity quilt, or maybe your fabulous pet needs a quilt for their very own. 1. Select 20 squares from your charm pack to be the centers of your blocks. Blue: You will need to cut 80 – 5″X2.5″ pieces. I start by cutting 10 – 2.5″ strips, then cut the 5″x2.5″ pieces you need from the strips. Brown: You will need to cut 40 – 2.5″ squares. 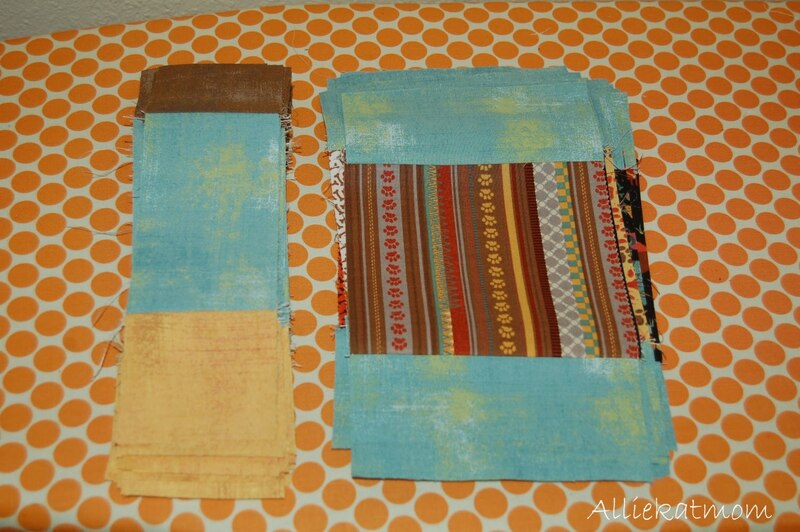 Start with cutting 2 – 2.5″ strips, then cut your 2.5″ squares from the strips. Tan: You will need to cut 40 – 2.5″ squares. 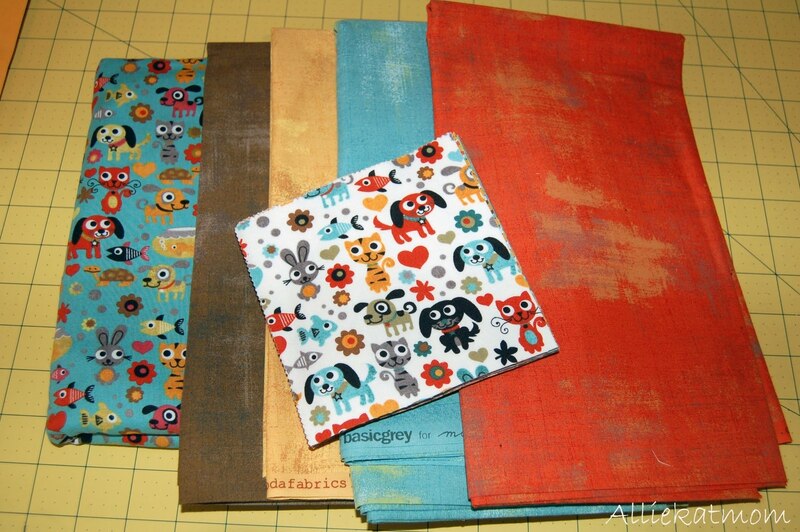 Start with cutting 2 – 2.5″ strips, then cut your 2.5″ squares from the strips. Start piecing the centers of the blocks. 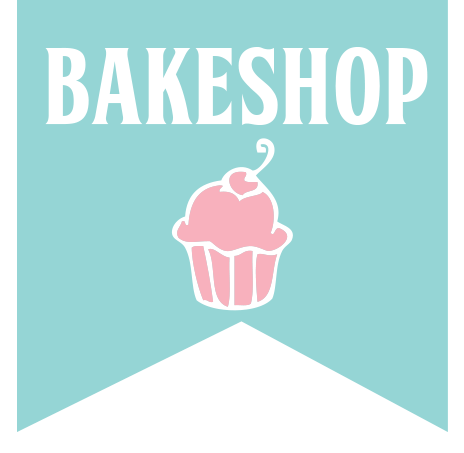 Use one 5″ square (charm) for the center, and 2 – 2.5″x5″ for the top and bottom. Sew all the 20 blocks in this fashion. You can chain piece these if it is easier. For the side pieces, you will need a total of 40. 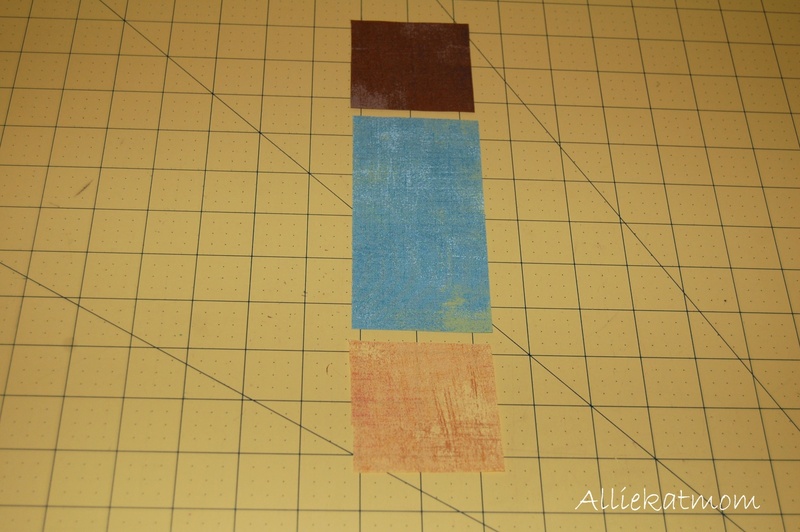 Sew a brown 2.5″ square and a tan 2.5″ in square on both sides of a blue 2.5″x5″ strip. Also chain piecing these makes the quilt go much faster. You will now have two piles that look like this. Next sew the strips to each side of the center block. 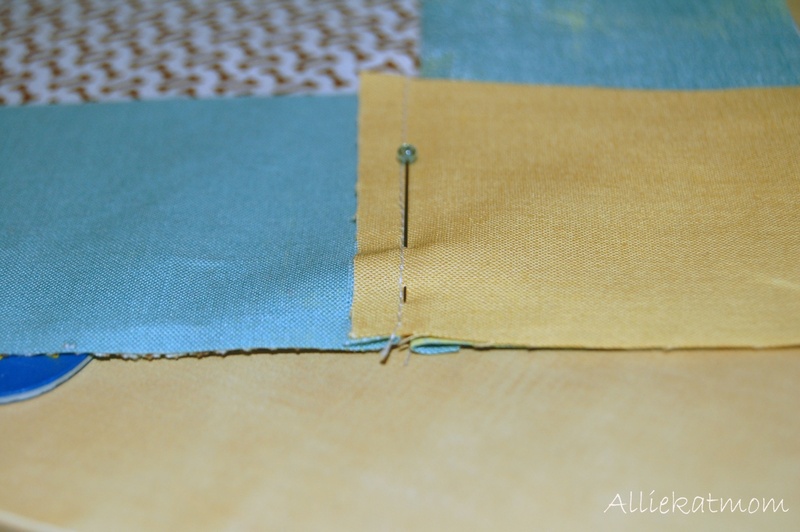 Be sure to line up the seams and pin so that your corners match up perfectly. I like to put my pins in this direction. This way you don’t have to worry about running them over with your needle, or having to pull them out as you go. The fabric is just as secure pinning this way as it is the other way. 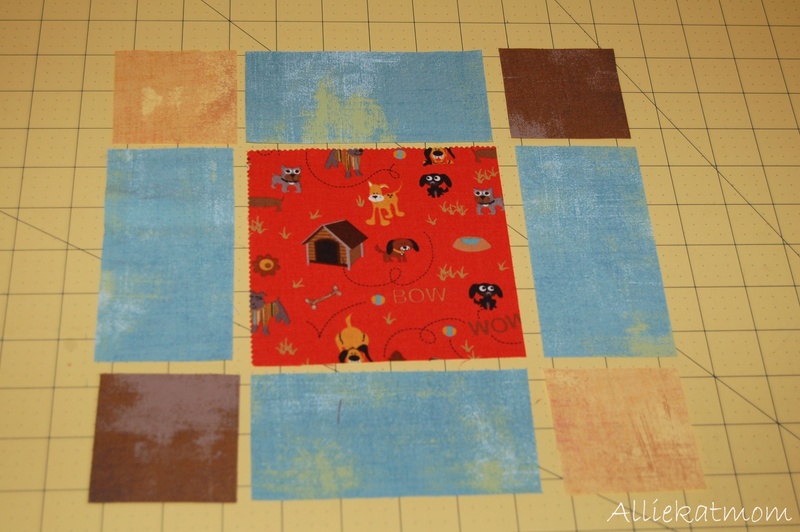 Once you have sewn the sides to your blocks, you should have 20 blocks that look like this. Layout all 20 blocks until you get a layout that you like. Sew your blocks into rows first, then sew the rows together. Baste your quilt, I like to use these T pins to hold my quilt down while basting. 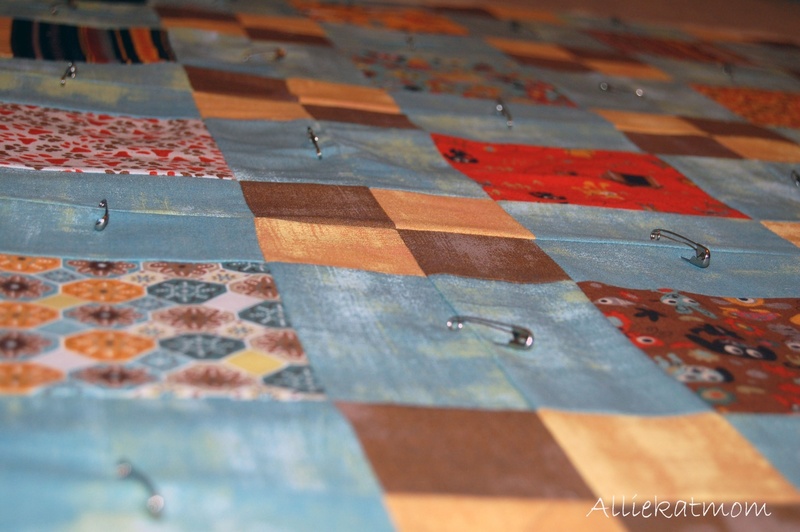 Then pin, I pinned every other square and it was just enough. Finally, quilt your quilt. 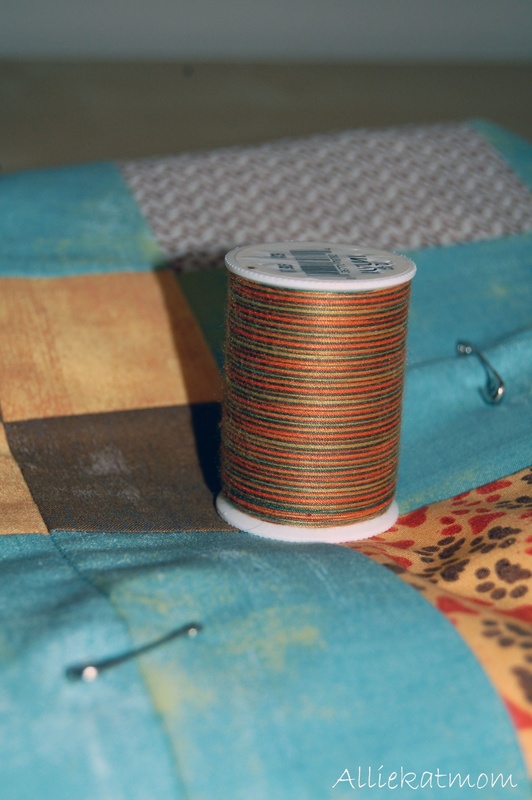 I used a nice fall color variegated thread. 6. Bind, wash and enjoy your new quilt. 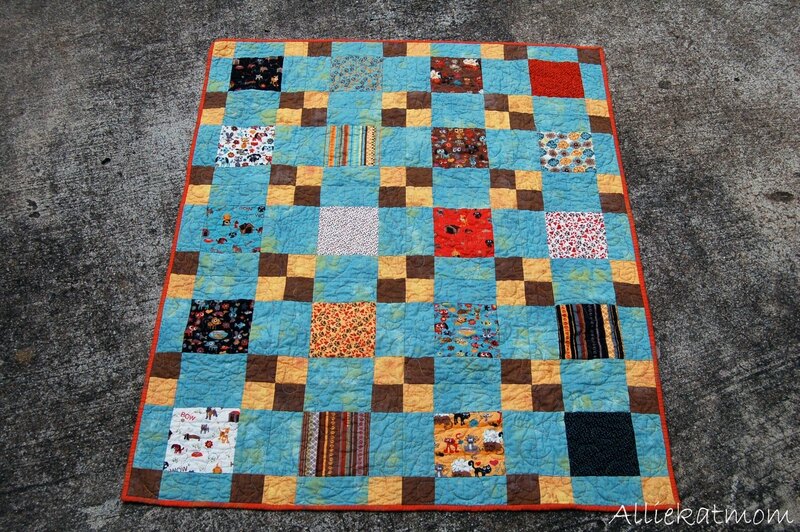 A 34×42″ quilt perfect for your pampered pooch or animal lover! I hope you have enjoyed this tutorial. Please feel free to contact me with any questions you may have. Step 1: Purchase or recycle a standard bed pillow. I chose a simple poly-filled pillow that’s on the firmer side. The firmness will allow the pillow to hold it’s shape better than if it’s too soft. Step 2: Measure the pillow’s length and height. Mine measured 24 1/2” x 18 1/2”. Given the dimensions, I decided on a 6” x 6” block. The keen observer will note that the total is short by a 1/2” on all sides. In this project, coming up short will work to the benefit of the end product. When the pillow is inserted, it’s always better to be a bit snug. The form of the pillow will remain firm instead of losing its shape after a few naps by your little pup. Step 3: Each block will be constructed in the same manner. However, each will utilize a variety of patterns from the collection. See the patterns photographed below. I grouped them in 3’s to show what I used for each block. There will be a total of 12 blocks in all. 4 blocks across by 3 blocks down. Note that the directions below are for the first block. The remaining 11 blocks are constructed in the same fashion. Use the fabrics illustrated in Step 3 to create the balance of the blocks. With right sides together, draw a diagonal line down the center from point to point. On each side of the diagonal, draw a line a 1/4” from the center. These 2 outer lines will be the lines you sew. Sew the left and right lines. Using your rotary cutter, cut the two pieces apart using the center line as your guide. Open the triangle and press it towards the darker fabric. Trim the tiny tails at each end. This exercise will give you the two squares you need for the block. Cut a 2” x 4” of the white fabric. Right sides together, sew the 2 pieces along the longer side. Open it up and press toward the darker fabric. 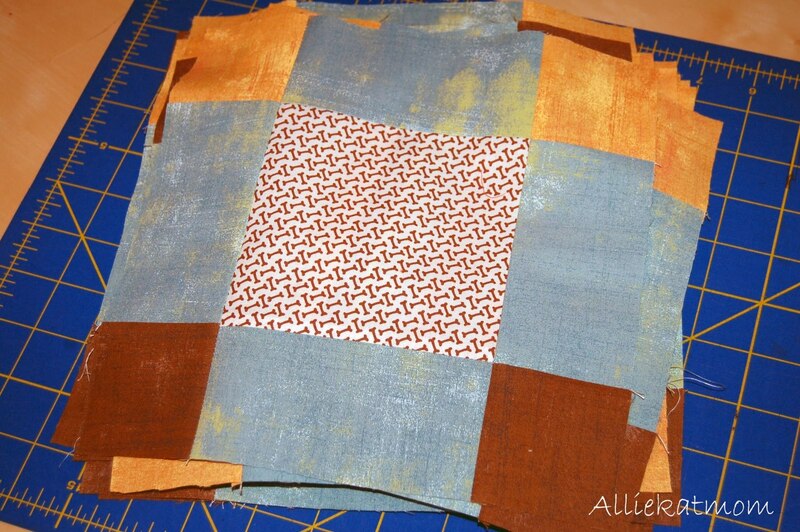 Turn the newly sewn piece horizontally and cut it into 2” block segments. 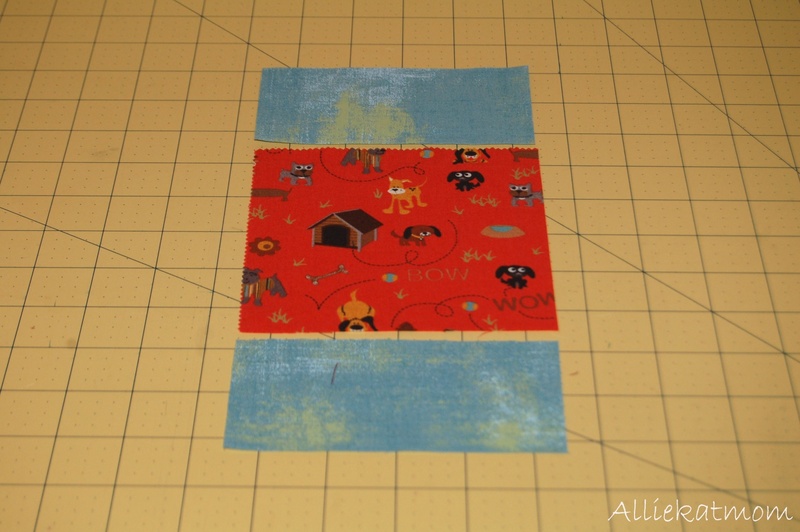 Reposition the 2 segments to form the 4 patch and sew them together. 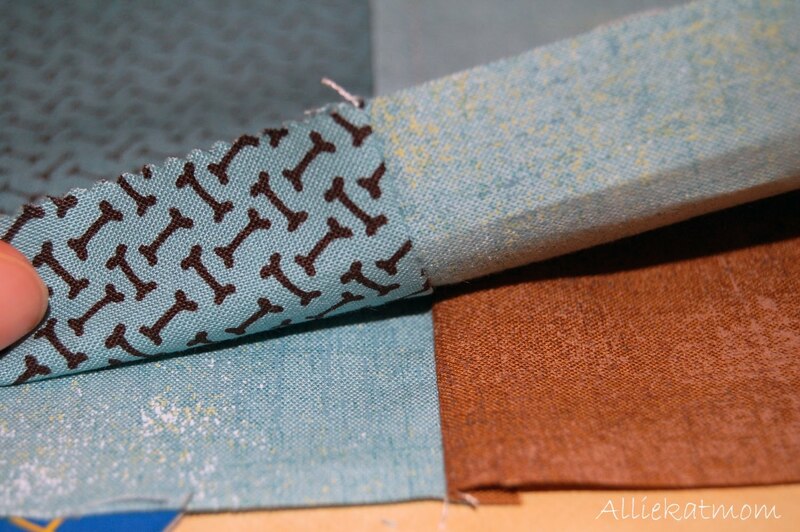 Repeat the same process for the remaining set of 2” x 4” fabrics. Sew the top and bottom sections in a pair. Sew the pairs into a block. This will yield a finished block of 6 1/2”. Repeat the above procedure for the remaining 11 blocks. Step 5: Sew the blocks together to form the top of your Poochie Pillow. 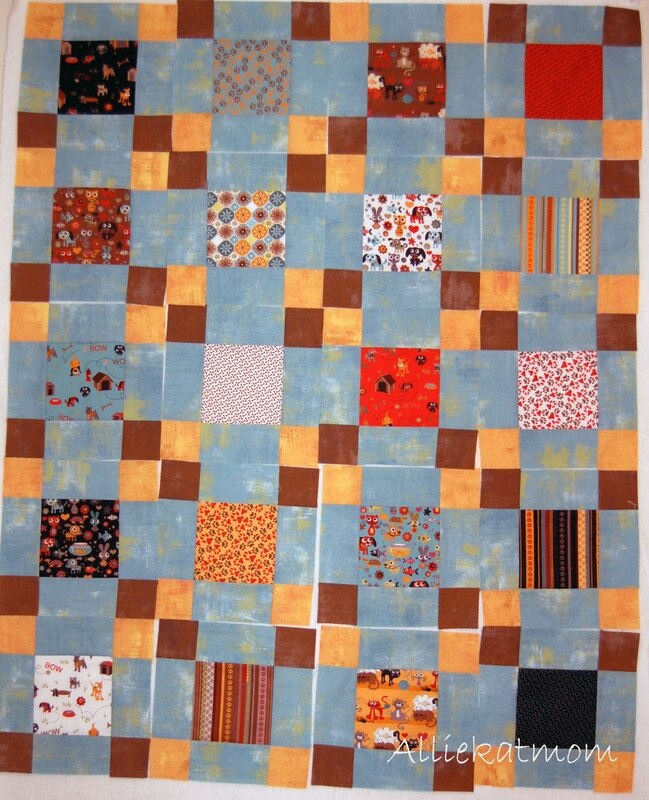 Start by sewing the blocks together horizontally and then sew the rows together to finish your top. Step 6: Measure your completed top to determine the size you need to cut for the bottom. It should measure 18 1/2” x 24 1/2”. The extra 1/2” will be taken up as the seam allowance when the two pieces are sewn together. 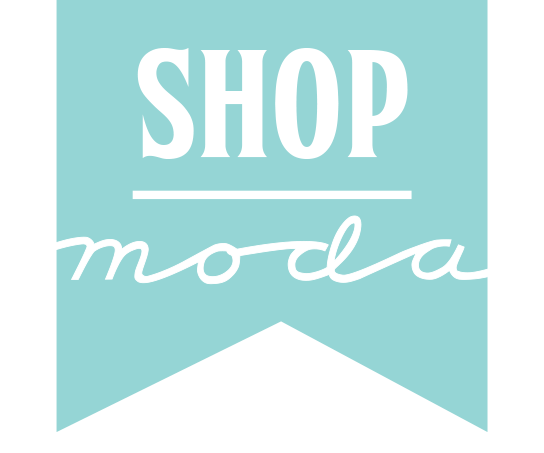 Cut a 18 1/2” x 24 1/2” back from the 1 yard cut you choose from the collection. I used the medallion fabric. Step 7: Sew the top and bottom together with right sides facing each other. Option: I added a zipper to the top of my pillow. Even though my little doggie is perfect in ever way, he sometimes sits down with dirty feet. The zipper will allow you to take the pillow insert out and wash the bed. I wouldn’t, however, put it in the dryer. You’ll note that I said the zipper is at the top. The top will actually be the back of the bed. It’s a bit of a mind bender but it will make sense by taking note of the picture below. You’ll see the zipper is behind the bumper rail at the top of the pillow. Step 8: Now it’s time to make the bumper railing. We know that the size of our pillow is 18” x 24”. Since the bumper is only on 3 sides, we’ll need approximately 60”. In order to allow for corners, we’re going to cut and sew a tube with a total length of 64”. We’ll be using the remaining fabric from the 1 yard cut to make the railing. Fold the piece in half lengthwise. The width should measure approximately 22” by 36” (the length of the 1 yard cut). Cut 2 10” pieces from the folded piece. Cut the 2 pieces to 32”. This represents half of the total of the tube. Right sides together, sew the 2 pieces together using a 1/4” straight seam. Press the seam to one side. Fold the newly created 64” piece in half with right sides together. Press. *The picture below is actually the back of the fabric. The shot appears as if it’s being pressed on the face. 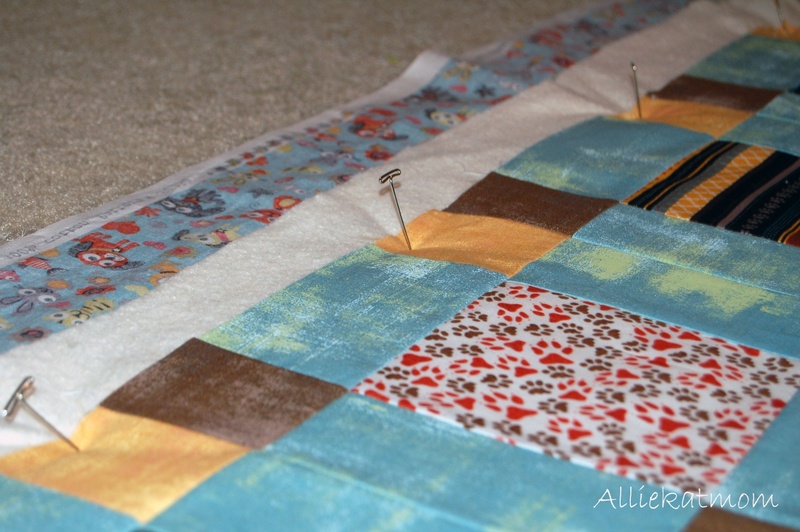 Sew down the length of the entire piece to form the tube. Reach all the way down and pull the closed sewn end out to form an open-ended tube with the right side now public. Step 9: Using a poly filling, begin to stuff the tube to form the railing. Don’t overstuff it! Just use enough so it will stand on its own. I used a yard stick to get the filling down to the bottom of the tube. You can also use your hand as if you’re putting on a long glove with a wad of stuffing in your hand. At approximately 19”, sew a single line down the tube. The 19” represents one side of the pillow. The extra inch will enable the tube to be turned when it’s attached to the pillow. Additionally, this will make for a creased edge. Continue to stuff and stop at 25” (the back horizontal portion of the pillow) sew another line down the center of tube. Continue stuffing until you finish filling the tubing. Whip stitch the end closed. It’s actually 1” longer than needed. Once you begin to sew it to the pillow, you’ll see that the extra 1” will come in handy to be able to form the tube around the pillow without stretching it. Step 10: Sew the tube around the 3 sides using a simple whip stitch. Step 11: Insert your pillow if you choose to use a zipper. Step 12: Find your furry friend and introduce him to his new Poochie Pillow.